Travel Photography for the Rest of Us! Claim Your Free 10 Part Photo Email Course! Ninja Free Tips On How To Immediately Improve Your Travel Images! 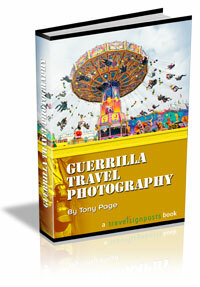 Get the Free "Guerrilla Travel Photography" mini e-course sent to you via email every two days for the next 3 WEEKS. Simply fill in your name name and email address in the form below to receive the first instalment of this e-course in your email box RIGHT NOW (check your email in a few minutes).